Pinwheel Cookies to Red-and-White Meringue Kisses to Apple Cider Caramels, find new inspiration for the best of seasonal baking with Holiday Cookies. It seems early to start thinking about the Christmas season, but it is never to early for me to start thinking about Christmas cookies and gifts to make. 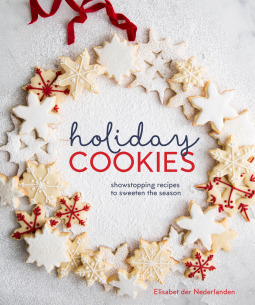 "Holiday Cookies" is a beautiful Christmas cookie book about how to make the most delicious gingerbread man you've ever seen or to enjoy the most delectable peppermint bark! This cookie book is small, yet full of the most festive, well rounded Christmas cookie recipes you could want! It has great tips on how to get the icing just perfect and I can imagine these will be favorite cookies for years to come. I love that this is a hard cover book too! I give this book 5/5 stars. A favorable review was not required.